The Elders meet with the President of China, His Excellency Xi Jinping and other senior leaders, in Beijing, April 2019. 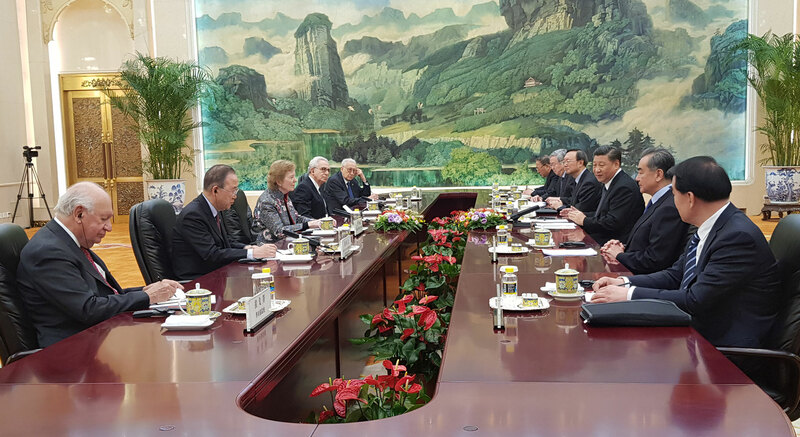 This Elders mission to China included high-level discussions on multilateralism, climate change and development, nuclear rearmament and non-proliferation, and human rights, alongside a ‘town-hall’ meeting with students of the China Foreign Affairs University. Although The Elders acknowledged China’s unprecedented international cooperation – including the Belt and Road Initiative - they also expressed hope that China will step up its efforts to make that cooperation consistent with the development needs, and financial and environmental sustainability of partner countries. President Xi expressed agreement on the dangers of nuclear rearmament and proliferation – asserting that there can be no winner from a conflict between major global powers. The Elders hope all permanent members of the UN Security Council share these concerns, and support their calls for a new nuclear “minimisation” agenda.